Ferrari has revealed the most powerful version of its 458, the 2014 Ferrari 458 Speciale which had its public debut at the 2013 Frankfurt Motor Show in September. The 458 Speciale is a completely new, uncompromising, streamlined sports car concept. 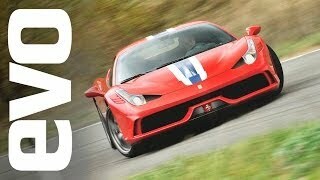 The 2014 458 Speciale gets the familiar 4.5-liter V-8 engine found in the 458 Italia. For 458 Speciale the engine delivers a total of 597 horsepower at 9,000 rpm and 398 lb-ft of torque delivered at 6,000 rpm. 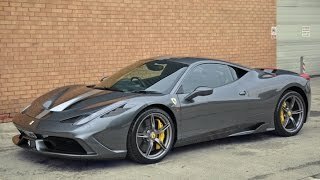 Ferrari claims that thanks to the 133 horsepower per liter, the 458 Speciale’s engine is the most powerful road-going naturally aspirated engine. 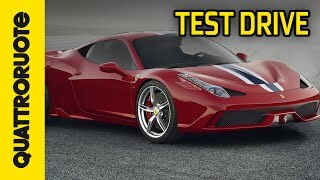 The 458 Speciale can sprint from 0 to 100 km/h in a mere 3.0 seconds (0-200 km/h in 9.1 seconds) and also clocked a lap time of just 1:23.5 at the Fiorano Circuit. Aerodynamic requirements guided the work of the Ferrari Styling Centre, to ensure they were more performance-oriented than ever. The most notable features in this sense are the front and rear movable aerodynamics which balance down force and cut drag. One of the most innovative features of the 458 Speciale is the Side Slip angle Control system (SSC). It performs instant-to-instant analysis of the car’s side slip and compares it with the target value based on speed, grip levels and other metrics. It optimizes both torque management and torque distribution between the two wheels (via braking). The car also gets Michelin Pilot Sport Cup2 tyres which were specifically honed for it and help it to achieve highest lateral acceleration (1.33 g) ever achieved by a car in the Prancing Horse range.